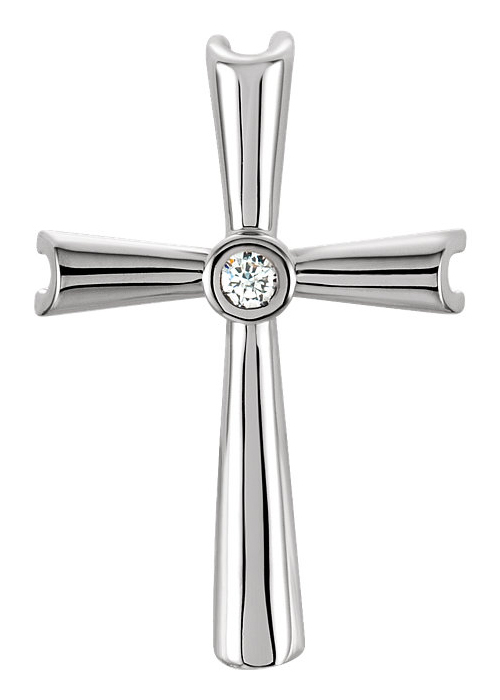 The Justified by Faith diamond cross pendant from Apples of Gold Jewelry combines a single diamond within a stunning 14K white gold cross pendant to make a beautiful piece of Christian jewelry that you will be proud to add to your jewelry collection. The pendant measures 0l28 inch tall by 0.55 inch wide, and has a hidden bale behind the cross to add your own chain. This beautiful cross pendant for women also has a single 0.04 carat diamond, which is rated G-H for color and I1 for clarity. The arms of the cross grow wider the farther they go from the center, to add an interesting touch to the pendant. We guarantee our Justified by Faith Diamond Cross Pendant to be high quality, authentic jewelry, as described above.